Horses are not machines. As trainers and owners, we are telling free-spirited, free-minded creatures, “Give me your body, mind, and heart—and trust me not to hurt you.” If I were a horse, I would ask you to make your case and prove it. Wouldn’t you? Most horses are giving animals. As herd animals, social acceptance is important to them. They want to please us. For me, that comes with a lot of responsibility. Mutual respect is paramount. Behavior and physiology are fundamental. My training goes far beyond the mechanics of riding. Without knowing how a person works, how can we train an athlete? The same goes for horses. I believe we must understand how their minds and bodies work in order to tell them how to carry themselves in healthy ways. Fit the session to the horse. My horse, Picasso, is a thinker. He enjoys the challenge and is a total show off. His brother moves gracefully and beautifully, but he’s more of a laid-back horse who has less interest in showcasing his grace. Every horse is unique in personality. Some horses are eager to dive in—some need a more gradual approach. Every day is different. If your horse has been out to pasture for an extended period of time, or he is a breeding stallion, those are physical considerations to be taken into account when deciding what to do for the day. I approach every horse differently and personalize my work to his needs on that particular day. Riding is a dance. I’ve been a dancer my entire life. In 2007, I started West Coast Swing—dancing that relies on sometimes just the connection of one hand to your partner. A skilled partner can communicate a lot through that one hand. They can lead you, tell you where their body is going, and what they want you to do. It’s just like riding. Most of the time, if a horse makes a mistake, it’s usually their lead’s fault. 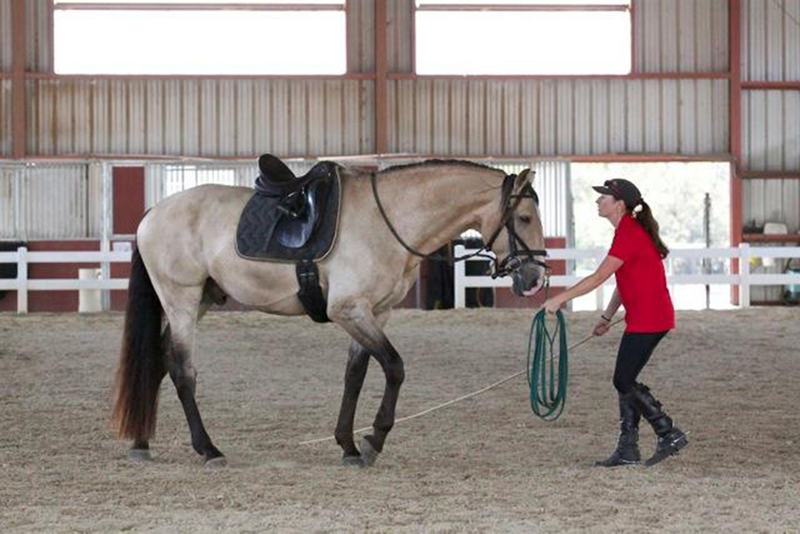 I train riders to be strong leads for their horse. Fixed deadlines create scared horses. I do not believe in dominating a horse into obedience, or breaking its spirit so it obeys because ultimately, you’ve achieved nothing except a horse that’s terrified of you. How quickly will a person learn to dance? It’s slightly different for every person—and it’s the same with horse. My training is a balance between pushing your horse out of his comfort zone while supporting and reinforcing what he’s learning. Kindness & mutual respect. When you’re on a horse’s back, you’re there at their courtesy. You’re asking for kindness on the horse’s part. You’re asking him to let you stay up there. Ultimately, it’s the horse’s choice. If the horse is too scared, or if you are unkind and cruel—how can we expect kindness? I’d rather be on a horse that respects me rather than one that’s scared of me. To help you determine if we are a good fit, let’s talk.